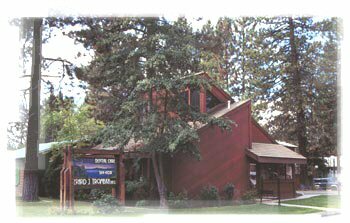 Our offices are conveniently located near Stateline, Nevada on Pioneer Trail in S Lake Tahoe. From the Nevada/California state line, come westbound into California and turn left at the 3rd light (Pioneer Trail). Our lovely redwood building is located (on your right) at the first southwest corner of Midway Road and Pioneer Trail. For convenient parking, please turn right and enter on Midway Road. Walk-ins are welcome! Typically, we care for patients – Monday through Thursday – 9am till noon and 1:30pm till 5pm. Please call regarding evening, weekend and other hours we can be available. Dental Emergencies: We will make every attempt to see emergency patients the same day!